Rederi AB Gotland’s new ro-pax, VISBORG, has been christened last Saturday in China. 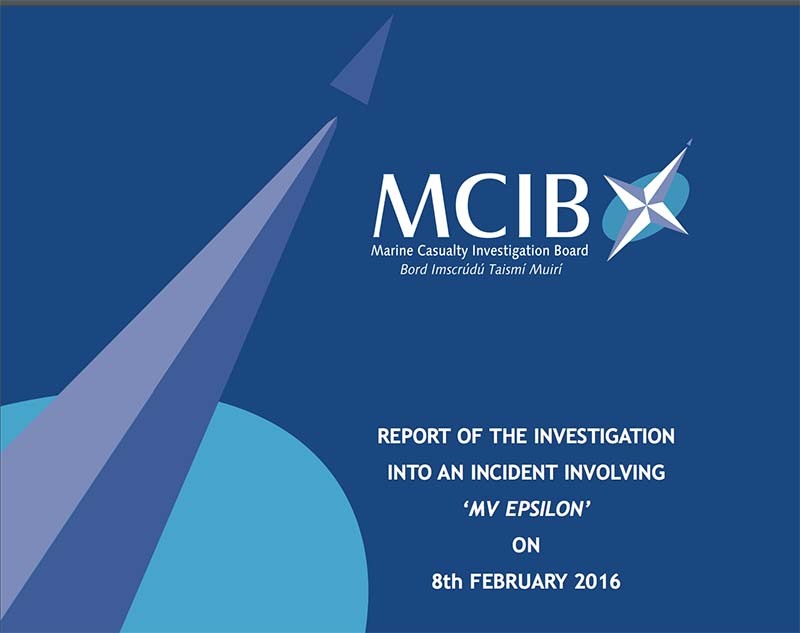 The Irish Marine Casualty Investigation Board (MCIB) examined an incident involving the Irish Ferries ro-pax EPSILON, which happened in February 2016. The report has been published and can be downloaded via the link below. What happened: after sailing from Cherbourg to Dublin the Italian-flagged vessel experienced adverse weather conditions (Force 10, waves 6-9m), causing cargo shifts, damage and injuries to people. Some issues: Senior Master versus Duty Master, cargo securing, weather forecasting. Conclusions in paragraph 5, and safety recommendations in paragraph 6. 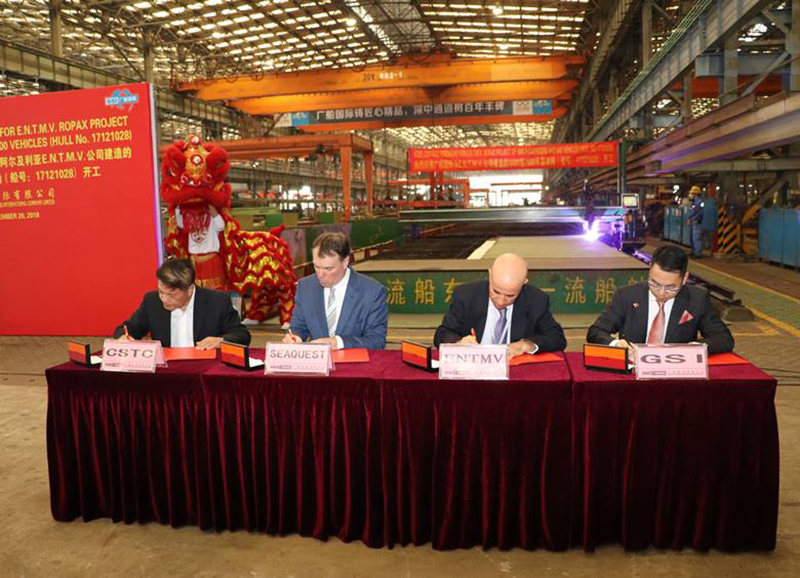 The building of ENTMV / Algérie Ferries’ new ro-pax has officially started after Wang Yanzhong (China Shipping Trading Co.), Jan Andersson (CEO Seaquest), Captain Ayed Abdeselam (ENTMV) and Zhou Xuhui (Guangzhou Shipyard International) signed the last documents. The vessel has a capacity of 1,800 passengers and 3,250 lane meters. The delivery is scheduled around mid-2020. SeaQuest has been appointed as new building project manager. Baleària is also finalising the construction of what will be the first two smart ro-pax ships with LNG engines to sail the Mediterranean. The HYPATIA DE ALEJANDRÍA is scheduled to begin operations early next year, followed by the MARIE CURIE a few months later. Meanwhile, the first of a total of six ships in the fleet will have its engine replaced this autumn to allow it to sail with LNG. The European Union recently awarded Baleària a grant of some €12 million out of the total investment €72 million. Within the next three years Baleària plans to have at least half of its ferry fleet using LNG, rising to a 100% of the fleet within ten years. 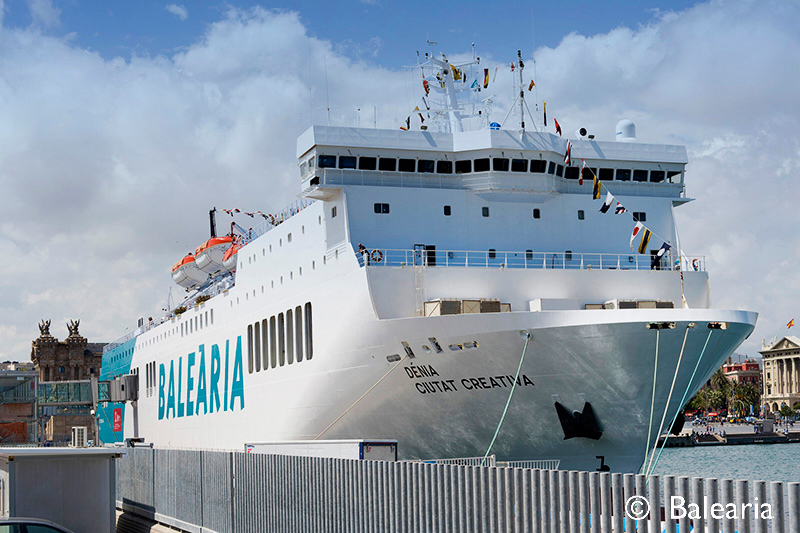 Baleària maintains six weekly departures in each direction between the ports of Málaga and Melilla, with ro-pax DÉNIA CIUTAT CREATIVA. Baleària operates this route through the Alboran Maritime Company, a company owned 50% by Baleària and Marítima Peregar. 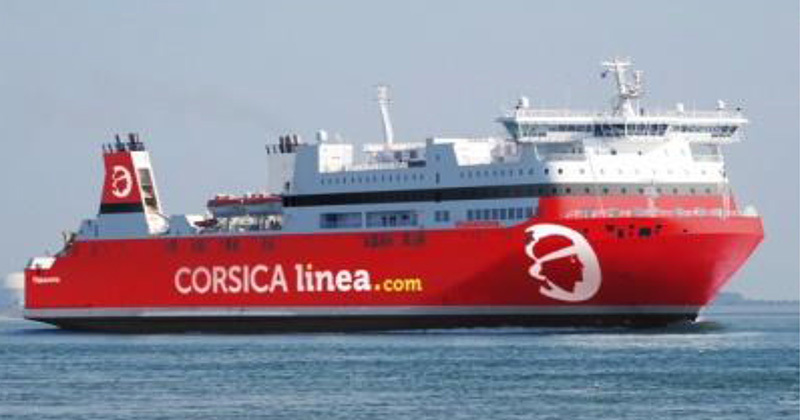 Corsica Linea has been testing a ferry route between Ajaccio (Corsica) and Porto Torres (Sardinia), with ro-pax JEAN NICOLI. In three days 1,500 Corsican passengers decided to take the opportunity to visit their Italian neighbours. The test was for passengers only, but there could be a market for freight. At least in one direction. Apparently Sardinian building materials are being exported to Corsica. 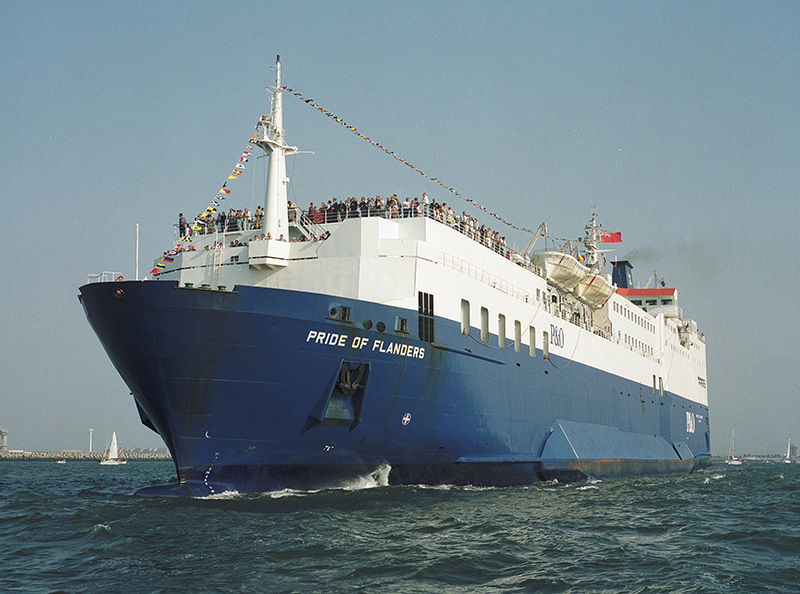 Corsica Linea has confirmed the long-term charter of ro-pax ferry EUROFERRY CORFU from owner Grimaldi Lines. She will be flying the French flag, and will sail on the routes from Marseille to Sardina and the Maghreb as from mid-June. She will be renamed VIZZANOVA. The French environmental organisation Robin des Bois (‘Robin Hood’) has published its 50th quarterly shipbreaking report. Since the start of the publications in 2006, more than 10,000 scrapped ships have been reported. Overall, the tonnage of vessels demolished in the last quarter of 2017 shows a drop by 29%. The Chinese Government has identified ship breaking as a major pollution risk. The end of the year was marked by the suspension of operating licenses for all but 2 or 3 facilities in Xinhui and near Shanghai. As a result, the tonnage of dismantled vessels fell sharply in China. The Top 4 of recycled tonnage consists of 1) India, 2) Bangladesh, 3) Pakistan, 4) Turkey. 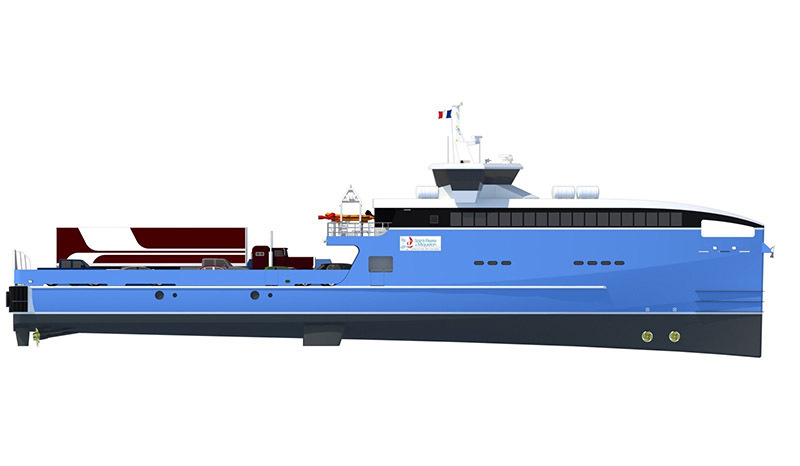 In 2015 Collectivité de Saint Pierre et Miquelon awarded the contract for two new ferries to operate between the two Islands and Fortune (Canada) to Damen Shipyards Group. In close cooperation with the client, Damen designed the Fast RoPax 5510, 55 m long, with a capacity for 192 passengers and crew, 3 trucks or 18 cars. The vessels named NORDET and SUROIT were heavy-lifted to Canada in November and have recently finished their local sea trials.